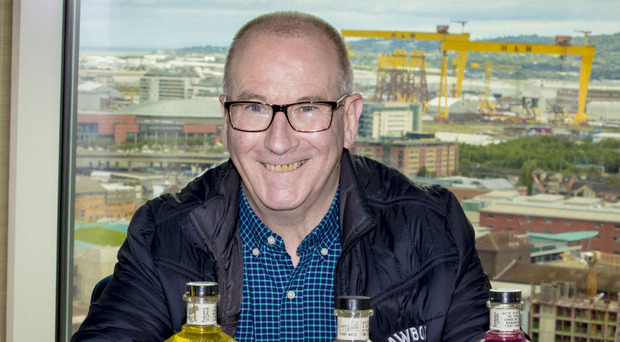 Fresh from celebrating his milestone 60th birthday, Gerry White, founder of Jawbox Gin, says the two years since he launched the brand have flown in. "But time flies when you're having fun," he adds. It is hard to believe that Jawbox gin has only been on the market two years such is its high profile, but Gerry, for whom the brand's journey has been a whirlwind, is loving every minute of those years. "I have more energy now than I had when I was 19," he says, just before celebrating turning 60 at a huge bash upstairs at The Duke of York. It will be a party to remember in the same space that played the backdrop to his 30th, 40th and 50th birthday celebrations. "Willie Jack (owner of the Duke of York) said I had to come back. It's tradition now," he says. A lot has happened for Gerry White since his last big birthday. All of his career was spent behind some of the best-known bars in Belfast. His last role, before creating Jawbox, was a job at the helm of the John Hewitt bar in Donegall Street, where he worked for 15 years. But today he's on the other side of the pumps, shaking on trade deals with publicans and jetting off to foreign shores to export his gin. In two weeks he'll take on the Swedish market to give Jawbox a presence in both the on and off trade there. Its a trip he could only have dreamed of when he trademarked the brand four years ago. "My life has completely changed. It's given me an energy and I'm on the go all the time, but you get an amazing buzz," says Gerry. "I'll spend a couple of days in Stockholm where we've signed up with a distributor. "There will be a couple of events too, mostly with the trade." Gerry grew up on Conway Street off the Falls Road in west Belfast and has spent most of his adult years living close to Queen's University. And with Belfast in every fibre of his being it is no shocker that his Jawbox gin is built on the legacy of the city. He says, as a barman, he always wanted to have his own drink and swayed towards gin because it was the only spirit he would drink. "It was considered an older woman's drink and I would say only within the last few years it's had a new lease of life, a resurgence, and that's because of the increased volume of quality gins and also thanks to barmen who are enthusiastic about it. "The have gotten behind gin. They're doing amazing cocktails and garnishes with beautiful presentations. It's a completely different thing now," says Gerry. He references a recent event that he hosted as a reminder of how gin has transformed its reputation and how his brand has converted even the most gin-averse drinkers. "There were people at an event at the Lobster Pot in Strangford who told me never in a million years would they drink gin, yet they drink Jawbox. "It's almost like the way people drink Bacardi but don't like or drink rum, like it's got a cult following." Jawbox was born when Gerry met with Echlinville distiller Shane Braniff and his head distiller Graham Miller to create a signature blend that would catapult Jawbox - a name Gerry had already thought of - to success. "When I met Shane and Graham I just knew this was it. They had the same passion and we worked well together," adds Gerry. "It might sound strange that even though Jawbox didn't exist, I knew what it tasted like. "I wanted something classic. And Graham knew exactly where I was coming from. It took 15 blends to get that taste and when we got it we just looked at each other and knew that was it." That process of refinement took three to four months says Gerry. Next followed the packaging and branding and that's when Drinksology, which looks after the distribution, marketing and branding of Jawbox, came on board. The name, however, is all Gerry's. "There's always something behind a name," he says. His grandmother Maisie helped influence the name. Maisie Cunningham would tell her grandchildren stories of how the community would gather round their Belfast sinks to catch up on gossip and local affairs. That ritual gave the humble basin the affectionate name of the 'jaw box'. "Not everyone would've had the privilege of having their own scullery so they shared a sink but more importantly that place became a focal point for the community," says Gerry. "When I was naming the gin I thought I need to be responsible so I thought it should be something that is shared and then I thought of gatherings and house parties. Where does everyone end up at a party? In the kitchen. It's the same ethos. Everyone still stands around the sink." The launch of Jawbox took place in Linen Hall Library, which continued the nod to the brand's Belfast heritage. "That was important to me. I'll never forget the weather that night. It was a stinking Tuesday night and I thought no one would come. It was a trade-only event and it's hard enough to get the trade out to a pub event but to have it in a library I thought this might not work." But it did work and almost 150 tradespeople came out in force to support "one of their own". "I do think they got behind me because I am one of them," said Gerry. And they still are getting behind him. 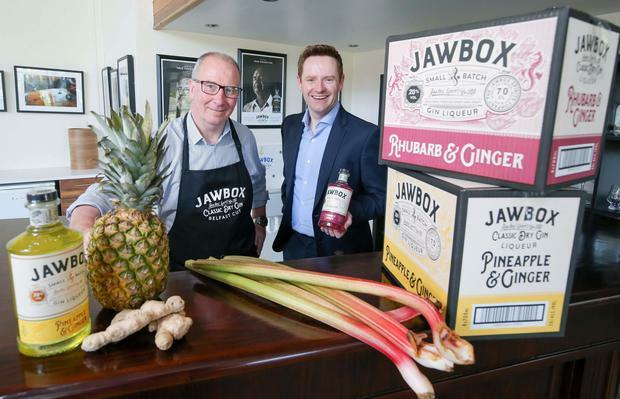 Chef Michael Deane and his contemporaries are all stockists of Jawbox. Michael has dedicated a dish to the brand. "It's a Jawbox and citrus-cured trout and of all the choices of gin, he chose mine. That's a Michelin-starred restaurant. They chose us and named it on the menu," says Gerry, still in a state of disbelief. Chef Niall McKenna has done the same. But even before such culinary endorsements, Gerry received his first real note of recognition when grocery chain Marks & Spencer decided to stock Jawbox after a blind tasting. It was this retail listing that boosted his already strong belief in his brand. "They fell in love with it. They were one of the first and chose it from a blind tasting. To me that was a big pat on the back. That was the stamp of quality." And today Jawbox is stocked in virtually every quality spirits retailer, restaurant, bar and major supermarket here. It's also stocked in over 5,000 retail outlets in England, Wales and Scotland. It has successfully risen to fame in the Republic, where Gerry spends two to three days of his working week, and just recently it checked into World Duty Free at Belfast City Airport, John Lennon Airport and London Stansted. As too has its new range of liqueurs - Jawbox Pineapple & Ginger and Jawbox Rhubarb & Ginger - which were launched in the summer. Gerry says cocktail maestros and customers are loving the newcomers. "They're flying off the shelves, and although I hate that phrase, it is true. I think they just work well with cocktails and the Rhubarb and Ginger goes well with Prosecco," adds Gerry. Next up, he'll be attending a global trade show in Sydney. "We are in eight different European countries and Spain has to be one of the biggest consumers of gin which is really great for us," says Gerry. "We have recently been selling in Canada too and that came about from a conference visitor. "A drinks distributor was here, in Belfast, with her husband who ran the Credit Union in Canada and she came into the John Hewitt and tried it. "She said she would contact me and I thought nothing more of it, but she did so we started to export it. "The Asian market has also been a revelation to us and as we speak we're going into Hong Kong." But what's most exciting for the man who quit his day job to follow his dream at the grand age of 57 is the brand's potential in America. "The big one for me is going live in the United States. The interest there has already been huge. "Bottle sizes for the States are different and they will go into production next month with a batch heading out in December in time for the New Year." Gerry has plans with former colleague and owner of the famous Dead Rabbit in New York, Sean Muldoon, to launch Jawbox stateside. "Being in America is the goal. Years ago I worked with Sean in the Northern Whig so we're talking to the guys and would hope to do the launch there. That would be perfect. It would great, two Belfast guys doing their own thing," he said. It's been a life-changing two years for Jawbox since it hit the shelves and a transformational experience for Gerry. While he won't quantify the rate at which production line is progressing he does say that in January this year he produced more gin than what he did over both November and December 2017, "because the demand is growing so fast". "I always believed it would be a success but the speed and the volume at which it's grown, I thought, would take us four years to get to that." Reaching out to his colleagues in the bar trade, where he spent most of his glory days, he added: "I hope when I'm out doing talks that I can be an inspiration to people, especially those who are a little older. I was paid handsomely, at 57, in a job that I loved. It was a huge risk to leave that. I cashed in my pension and savings to start this. So everything that I had went into this gin. "My life has completely changed. It's given me an energy. What I can achieve in a day is amazing."